To get started, I purchased the Mike Schley’s player maps from the D&D Starter Set adventure, so I wouldn’t have to recreate them. 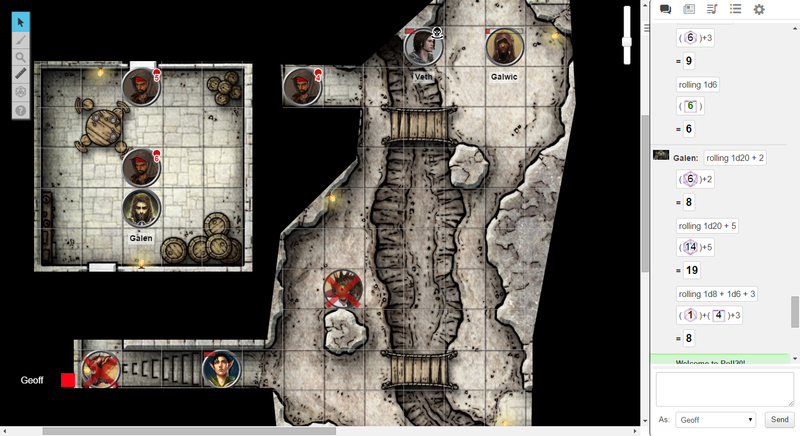 I scaled them down a bit before uploading to my account in Roll20, so that they would use less of my free storage, but still look good even when the map is zoomed in. 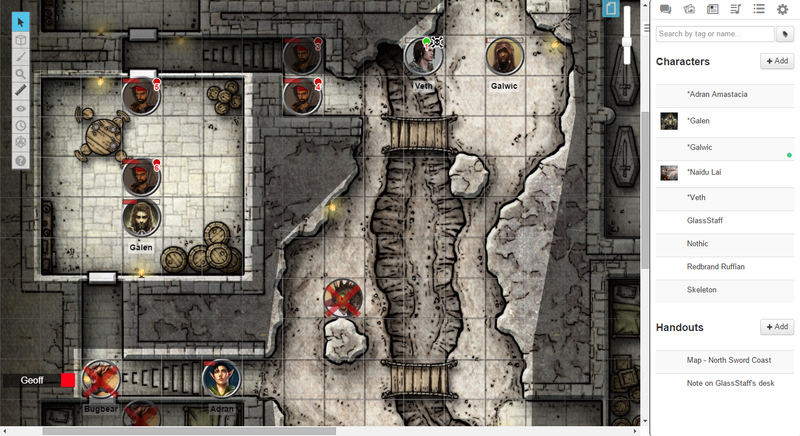 A GMs view of the Roll20.net virtual tabletop. I prefer the pog-style portrait tokens to the overhead style that is used by most of the art available in the Roll20 marketplace. I invited my players to select character portait images. Then I used GIMP to create token images for the PCs, NPCs and monster. I’m pretty happy with the result. Even though the recommended size for token images is 70×70 pixels, I used 110×110 to keep some detail when zoomed in. Here’s the GIMP file I used to create them. At the table, we use Jamie’s laptop to connect to the display for everyone to see, and I use my own laptop to control the game. I have granted the remote player control over his character, and Jame has control over the other characters, so he can move them around and adjust their HP. I chose not to use the full character sheets, which Roll20 does support, in favor of a reduced set of stats that would be relevant to the way we’re using the virtual tabletop. Specifically, I’ve added HP, AC, Passive Perception, and Initiative. Players at the table and I are using our physical dice, while the remote player has been using the built-in dice roller. Jamie and I have explored macros, but I haven’t used them during the game, yet. The next feature I’m looking at using is the turn tracker, which I think could be helpful. I’m also giving some thought to other ways to speed-up play so that we can get more done in the hour-ish time we have each week. As I mentioned in the intro, I think this hybrid physical/virtual table has been working reasonably well. I’m looking forward to using it more, and maybe even getting a fully virtual game going with some friends that I haven’t gamed with in a long time. I’d love to hear from folks who use Roll20 or other virtual tabletop. What tips or tricks have you found most helpful to make your games run smoothly. How far we’ve come from pointing a web cam at the battle mat! I do recall fondly how you set up an extra camera to show your dice rolls. Do you find you’ve had to institute any particular rules of discourse to make sure the remote player can participate fully? Our remote player can speak over the phone or enter chat in the sidebar (and the PC will chime) to get our attention. I think the biggest challenge is falling back into the tactical skirmish type game mode. I need to spend some time thinking about ways to keep the game flowing.